It’s wooden toys like this that make me wish I wasn’t a last minute present buyer. Good quality, affordable, eco friendly and seriously, seriously stylish. One of these days, when I shop more than one day before an event, these Woodies will be my first stop. Now I have admitted before that I am pretty fussy when it comes to toys. That said, I absolutely rate these Woodies by Go Home Junior. Designed in Australia and made from sustainably grown beechwood, they are created to last forever if taken care of properly. Isn’t that such a lovely thing to hear? Objects made to become heirlooms, not landfill. Let me just take a moment to appreciate that sentiment. Sigh. I have a dinosaur lover in my home and Daisy the Dipolodocus would receive a seriously warm welcome. She is 33cm long and costs $33.95 from Urban Baby, shipping is $9.50. If you’re looking for something smaller, her little sister is also available. There is a great collection of robots too, in all sizes from pocket to a whopping 43cm tall. These Woodies are all flexible, connected with strong stretchy cords and this makes them great for strengthening little hands in preparation for pencil holding. Imagine how lovely these guys will look look perched on a bookshelf or bedside table – or even scattered around the floor of your living room. Because let’s be honest, that’s where they are going to mainly hang out. 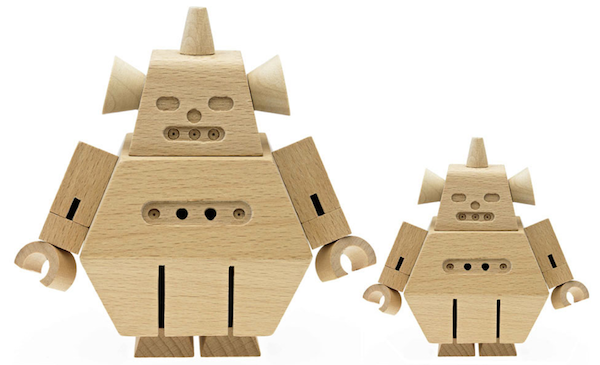 Browse our archives to find more glorious wooden toys.